The boys and I (two bar fellows and one doorman) are lookin for a name for our night>>give a shout if you have an idea. Apparently things got crazier on the dance floor than I realized. Leave the taco eating for the taqueria, madame. The Local 123 Opening for Christian DeFilippo was great–thanks to Sam for bringing his excellent amp help. I love that spot, coffee and yumminess galore! Plus they serve beer on tap now, and make a lot of their foods right in house. I had a great time, and the art is worth checking out. I dressed up as a figure I thought he would’ve painted, which means I got to wear my favorite black wig AND play records. Score. A friendly reminder while we’re on the dj-tip is I am still doing the Babe Cave every Sunday as well. Four hours of brunchy-goodness (Foreign Cinema style–except you eat it with us in Laszlo while I play records–riiiiiiight?? in the CAVE), and right near the 24th street Bart for you East Bayers. Plus FREE DONUTS. Oh yessss, the Layover is one of the freshest spots in Oakland, y’all. The sound is good, the spot is cozy, the peoples is nice, and the cocktails are slammin. Come see for yourself next week, won’t you? Let’s smoke up the dance floor. See you there. Sometimes a Mom’s gotta do what a Mom’s gotta do. 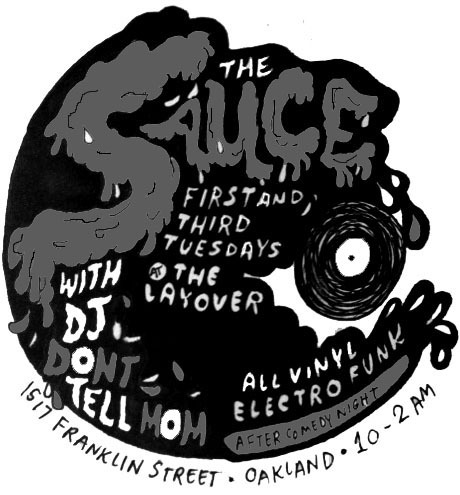 AND tomorrow night, Don’t Tell Mom will be playing some records down at the LAYOVER for First Fridays. My very first First Friday gig, evz. 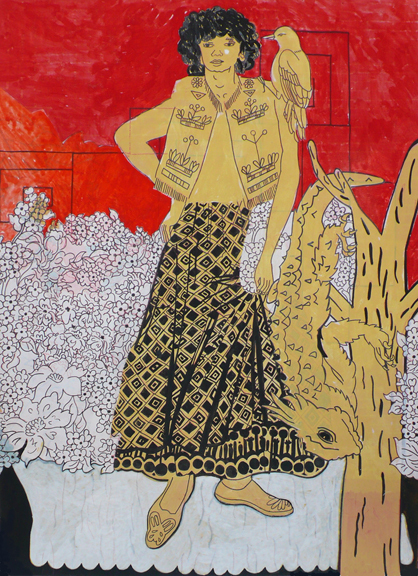 Mr. Tim Martinez will have his paintings up in the bar and next door at the gallery, they’ll be mixing some delicious cocktails, and I’m bringing a stack of new stuff. 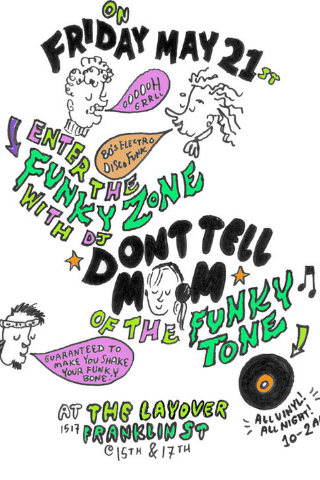 Come shake a leg or two or three. And watch out for those computer whizzes, ok? I’m playing music this weekend a bunch — Friday at the Layover for Happy Hour, and Saturday at the big dance bash over at the Oasis. Come Friday and have a drink on a cozy couch, then come dance under a homemade disco ball in strobe lights on Saturday night. Solo on Friday and gettin down with the Boogeymenz on Saturday–Facebook peeps look here for the FB invite Joseph made just for you. ‘S gunna be good. AND I’m meeting today with my Do You Like gals to do some editing of the giant backlog of video we have for you. Expect to see some bmxing and more Andrew Rubin Stevenstein soon. In other news: how about THIS INCREDIBLE WEATHER?? Ah, California, you and your siren song of sunshine and blue sky. Have an excellent Thursday, y’all. p.p.s. 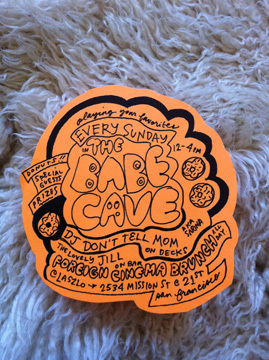 don’t forget BABE CAVE on sunday. WHEW, musical weekend! ok ok you got me, IT”S ME! tonite tonite tonite 6-8pm at the Layover in downtown Oakland, near the 19th street BART stop…come try it out with me! Have a good Thursday, y’all!